Working on a recipe, and just discovering that you're out of the type of vinegar called for? No biggie. Here are substitutes for every type of vinegar imaginable—probably even some you've never heard of. Often used in Asian recipes, rice vinegar adds a sweet, mild snap to dressings, marinades, stir-fries and more. If you don't have it in the cupboard, a substitute for one tablespoon of rice vinegar is one tablespoon of white wine vinegar, plus 1/4 teaspoon of sugar, or one tablespoon of apple cider vinegar, plus 1/4 teaspoon of sugar. In addition to adding a fruity punch to recipes, apple cider vinegar is known for its many healthful properties, such as controlling weight gain and blood sugar levels. Use it in juice blends, teas, dressings and sauces. For one tablespoon of apple cider vinegar, substitute one tablespoon of lemon juice, one tablespoon of lime juice or two tablespoons of white wine. These substitutes won't give you the same health benefits, but they will come close to approximating the intended flavor in recipes. Both sweet and luxurious, balsamic vinegar adds a rich, low-acid flavor to dressings, glazes and sauces, but since it's aged like wine, it tends to be more expensive than other vinegars. For one tablespoon of balsamic vinegar, substitute one tablespoon of either brown rice vinegar or Chinese black vinegar, or follow these instructions to make a substitute from apple cider or red wine vinegar and either sugar or honey. Champagne vinegar brings a bright flavor to salad dressings, without an overly acidic bite. It's best known for a flavorful champagne vinaigrette, but it can also be used in glazes for pork, chicken and other meats. Because it's so mild in flavor, it's important to choose another mild flavored vinegar as a substitute. 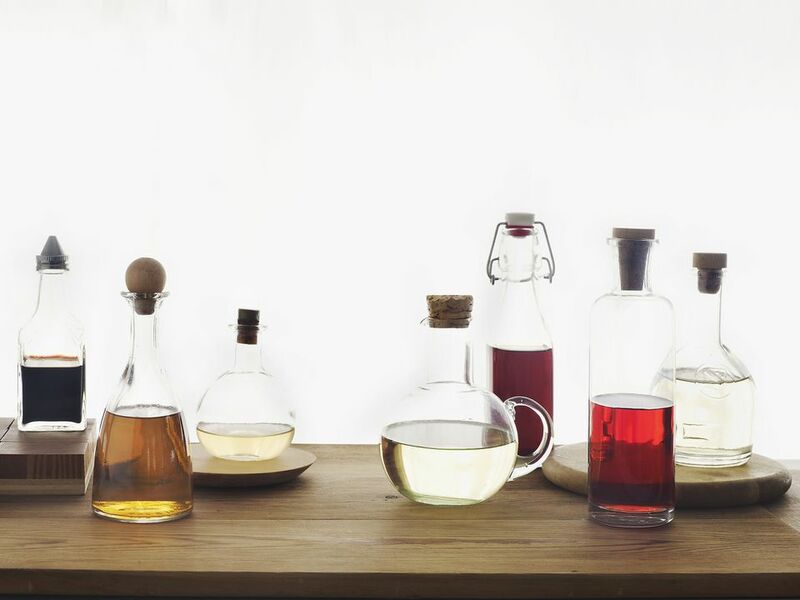 Most vinegars will overpower the other flavors in a recipe that calls for champagne vinegar. Try one tablespoon of either white wine vinegar or red wine vinegar in place of one tablespoon of champagne vinegar, and you should get good results. A splash of white wine is another solid possibility. A staple of Italian-American salad dressings, red wine vinegar also pairs nicely with chicken and other meats. A good substitute for red wine vinegar is equal parts white vinegar and red wine; e.g. 1-1/2 teaspoons white vinegar, plus 1-1/2 teaspoons red wine for one tablespoon of red wine vinegar. If you're trying to avoid the alcohol, try a mix of grape juice and white vinegar. Like red wine vinegar, white wine vinegar adds a nice acidic bite to salad dressings, meat glazes, and sauces. An easy substitute for one tablespoon of white wine vinegar is one tablespoon rice vinegar. An equal amount of white wine will also do in a pinch. White vinegar has a great reputation as a household cleaner, but it also brings a bright flavor to salads (especially coleslaw), barbecue sauce, pickled vegetables and more. For one tablespoon of white vinegar, swap in one tablespoon of either lemon juice, lime juice, cider vinegar or malt vinegar. If you're working on a recipe that you plan to can, stick with the white vinegar called for, even if it means a trip to the store. You don't want to inadvertently lower the acidity of a recipe that you'll be storing long-term. A staple condiment to fish and chips, malt vinegar is especially tasty in sweet and sour marinades, chutneys and pickles. For one tablespoon of malt vinegar, use one tablespoon of either lemon juice or cider vinegar. Sherry vinegar makes a tasty meat or fish glaze, pairing especially well with chicken and herb flavorings. A substitute for one tablespoon of sherry vinegar is one tablespoon of either red or white wine. Oftentimes, recipes will call for a vinegar flavored by herbs such as tarragon, rosemary or thyme. Herb vinegars taste great in salad dressings, but can also be quite versatile. For one tablespoon of an herb vinegar, swap in one tablespoon of either wine vinegar, rice vinegar or cider vinegar, adding in an appropriate and complementary fresh herb. Once trendy for adding a sweet punch to raspberry vinaigrette, raspberry vinegar also tastes great in glazes. One tablespoon of sherry vinegar is a good substitute.